Some folks seem to hate basil. Willing to return a slice if the fragrant green stuff finds its way on their plate. Being in Los Angeles a lot of people assume it's cilantro. We've even had a few culinarians request we "hold the lettuce". This simple touch of adding basil And parmigiano-reggiano to each slice was inspired by Di Fara pizza in Brooklyn. We spent some years in Brooklyn and Manhattan. Ate a lot of good and terrible pizza. 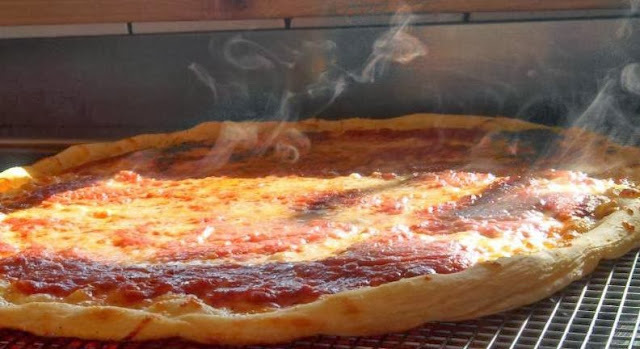 The Grandma pizza is on our menu because of Maffei Pizza. Which now has closed due to high rent. Good news for you guys, we make the best Grandma Pie. Either coast.